With a huge range of Australian native plants available for sale by online and mail order nurseries, you can now buy and have delivered by post just about any Australian plant you can think of. Plants for sale online are mainly smaller plants, or tube stock, more advanced container grown plants are available from specialist growers. What Plants are available ? 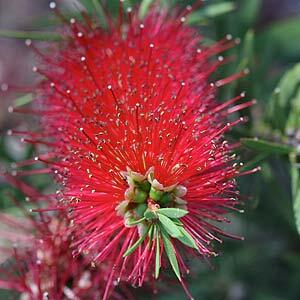 From the species such as Callistemon kennmorrisonii pictured right, to the many hybrids and improved cultivars you will find a huge range of plants to suit any landscaping needs. Hedging plants in a range of sizes from taller growing types to low growing border plants are a distinct group. Rare and unusual native plants are now becoming more readily available, and online is the place to find variety. Gone are the days when you needed to scour specialist nurseries for most species. We provide and Australian native plants guide, complete with descriptions, pictures and growing notes. Search our A – Z guide and find a huge range of Australian Native plants online from a range of growers. Ferns, native grasses, flowering shrubs and trees are all a part of the diverse range available, and include many plants not readily available at retail outlets. Many are available as tube stock, which is one of the best ways to buy Native Plants. They establish more easily, are cheaper and are simple to transport. More advanced specimens can be obtained if required. Some quarantine restrictions will apply between states, check with your local supplier. An excellent way to source plants for the garden or re vegetation projects, native gardens, general landscaping and even commercial developments. We list the best Australian Native Plants for Sale as well as nurseries and growers in Australia that can supply and deliver online and by post or courier.